The Doctor, Nyssa, Adric and Tegan have accidentally landed on both sides of a royal marital spat. Navigating this political minefield means they’ll have to take on some unaccustomed roles. 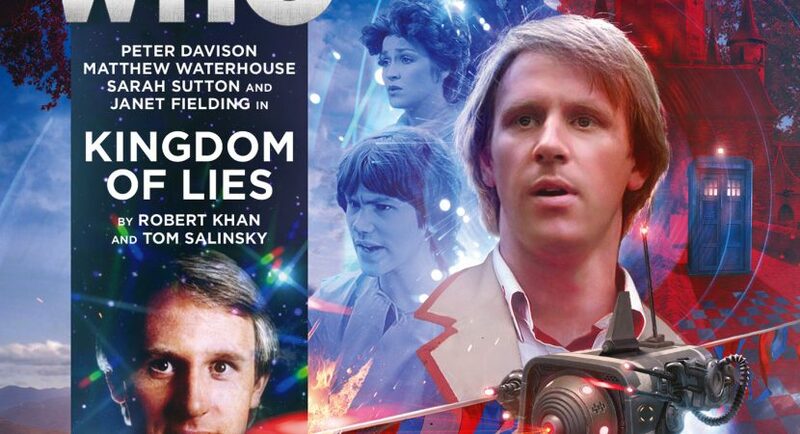 Nyssa and Adric assume their new duties with hilarious (if clumsy) gusto, while the Doctor and Tegan attempt to be voices of sanity. It’s all fun and games until they discover they’ll have to assassinate someone — or possibly each other — in order to survive. Whatever happens, you can be sure it’ll be all over the tabloids by tomorrow morning. Crowded TARDIS teams can be difficult for writers to juggle, but they also provide more opportunities for enjoyable Doctor/companion and companion/companion interactions. This time out, the Doctor and Nyssa are off being clever clogs and tech heads while Tegan and Adric use diplomacy (!) and common sense to win a place at court. Tegan: We should go out there. Tegan: It’s what the Doctor would do. Adric: I know. It’s an extremely annoying habit. All four of them have chances to use their unique skills at some point, with the Doctor stepping into his proper role as lead do-gooder and problem-solver in part 4. Tegan doesn’t have quite as much to do as the others, but as usual her snark makes up for lack of action. And Sarah Sutton had far too much fun with this script. Since this is a farce, the guest characters are fruity and entertaining, if shallow. There’s a tepid Duke and his PR-savvy Duchess, overbearing in-laws, and a couple smooth-talking royal advisors who seem to be doing all the work. A few of these characters are not quite as superficial as they seem. Needless to say, I loved this audio. I’ve been wheedling BF to give Team Five more lighthearted stories to balance out the more serious and angst-laden dramas. Time in Office already provided most of what I was hoping for, and Kingdom of Lies fulfills the second half of my wish: a story involving Nyssa that (a) isn’t depressing and (b) isn’t one I’ve listened to a gazillion times. But even if it’s lighter fare, there’s still a few Gordion Knot sized ethical dilemmas for the Doctor to solve, and plenty of life-threatening danger and action to keep the TARDIS crew on their toes. Probably because I’m not British, it took me a second hearing before I realised that Kingdom of Lies is not so much a farce as an oblique satire. Any resemblance to actual persons, living or dead, is probably deliberate. I hadn’t made the connection before, but those of us who grew up watching the Fifth Doctor era of classic Who also remember the whole sorry spectacle of Prince Charles and Lady Diana Spenser’s fairytale wedding, unsuccessful marriage, messy separation and tragic coda, played out before our eyes in lurid detail by a salivating press. The scriptwriters of Kingdom of Lies are exactly my age, so I’m not surprised that saga left an impression on them as it did me. At first I thought I was imagining things, but there were too many Princess Diana references woven into this audio to be an accident: “People’s [Duchess],” the “candle in the wind,” “there were three of us in this marriage,” etc. Even the Duchess’ aptitude for eliciting sympathy via press interviews and photos sounds familiar, if exaggerated, as does the chump Duke’s difficulty in earning the same level of popular support as his wife. In the real world, of course, wild conspiracy theories about the princess’ death being arranged by her estranged spouse were bogus and thoroughly debunked, but they suggested an interesting premise for a piece of fiction. I’m not sure there was any deep political message here other than a cynical parody of royalty. However, that premise simply launches the opening scenario, and is later superseded by the in-laws declaring war on Cicero Prime, the clever twist that the “third person” in the marriage turns out to be a holographic double agent, and the arrival of the one-dimensional and bloodthirsty villain. Sometimes we don’t want morally grey antagonists, but rather an uncomplicated baddie for the Doctor to outwit and triumph over.